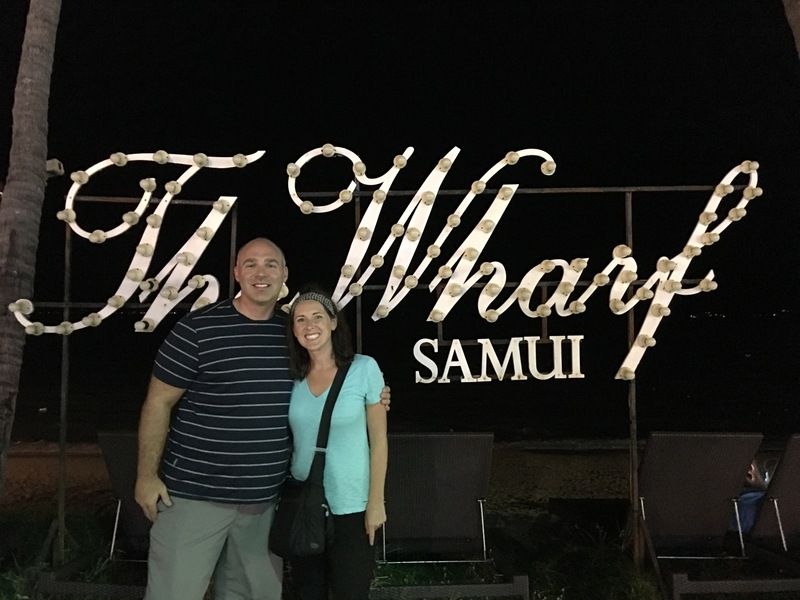 We left India on December 23th and arrived in Koh Samui, Thailand on December 24th (Christmas Eve!). They’ve gotten good at this! After flying all night the boys were taking a nap while we waited for our taxi. 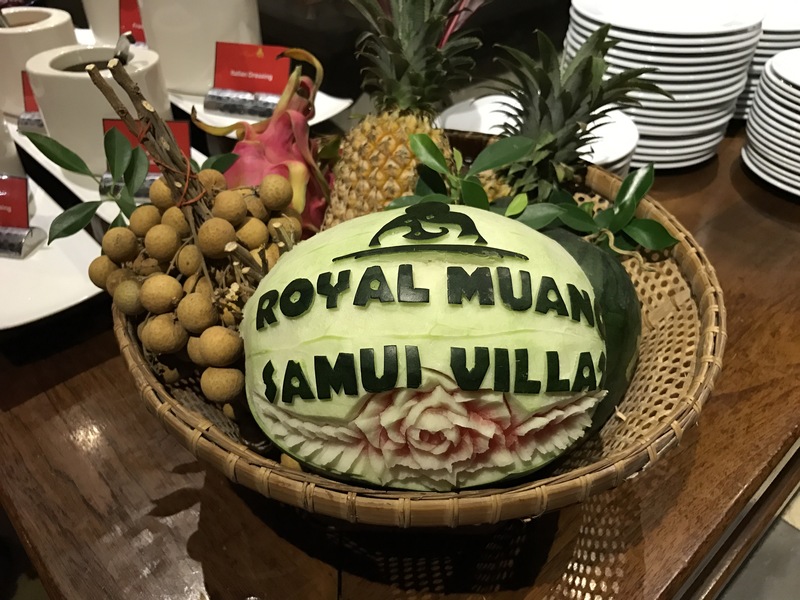 Koh Samui is off the east coast of the country and is Thailand’s second biggest island. 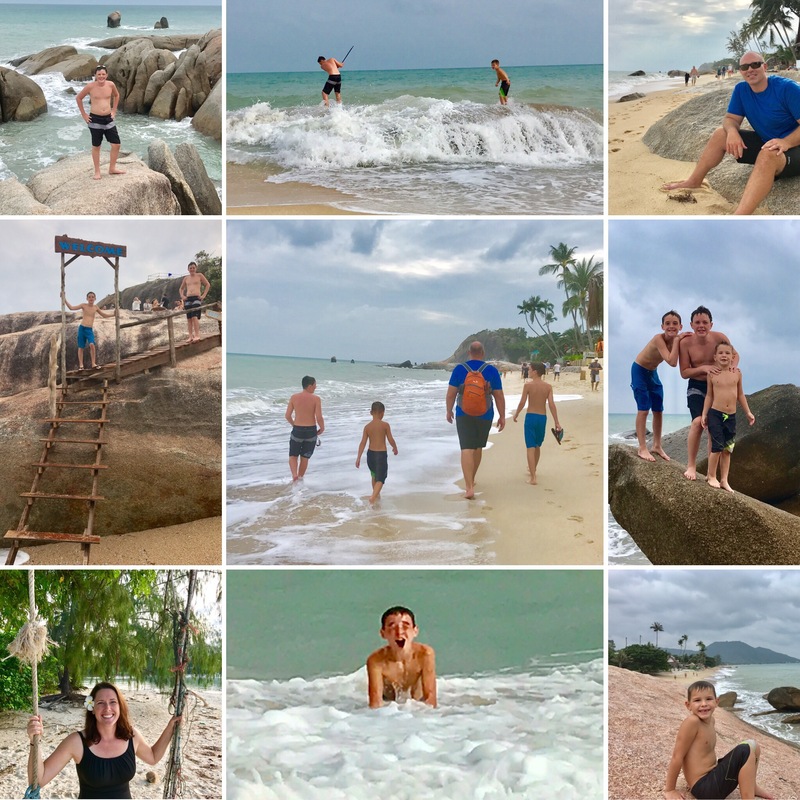 We stayed the first 5 days on Choeng Mon Beach then moved to another area of the island (on Lamai Beach) for a few more days. 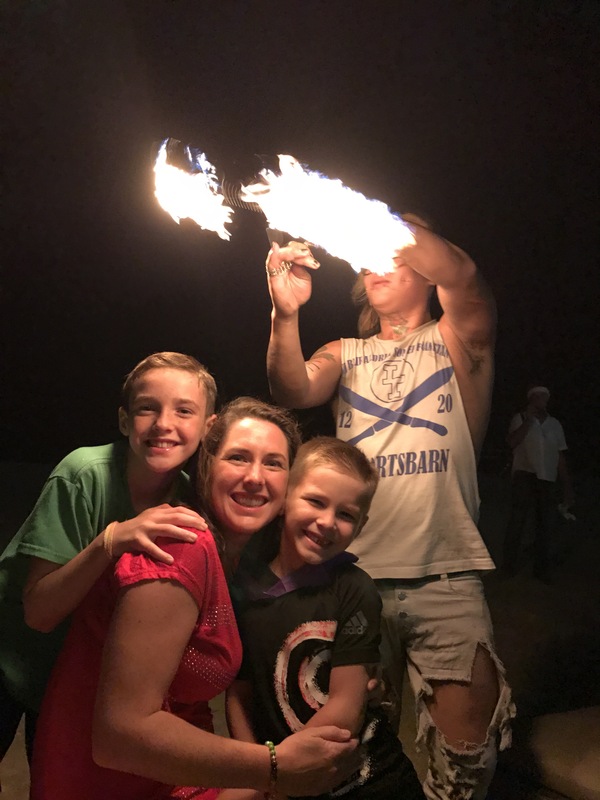 We learned from Thanksgiving that it’s best to try to do something totally different than usual on the holidays so we don’t miss home so much, and we succeeded! 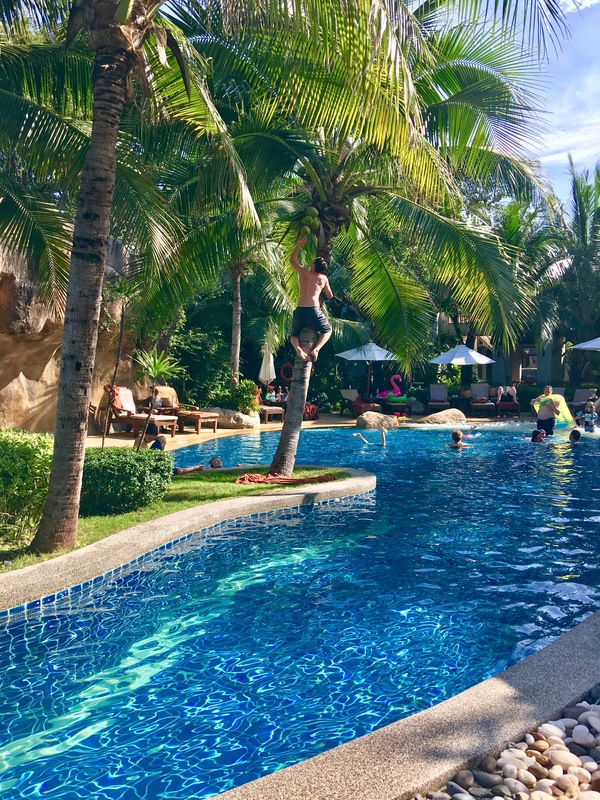 We traded a Christmas at home with presents, traditions and family for being able to jump into our pool from the hotel room, massages on the beach, and body surfing! For me, nothing can really beat being with family, but this was a close second! 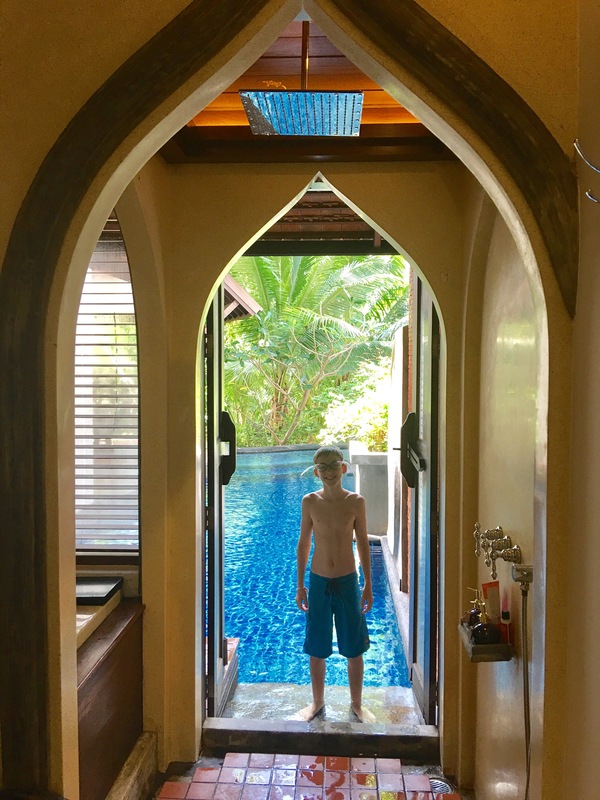 It was so much fun jumping into our own pool from the bathroom or directly from the living room! Yes, there were plenty of times a cannonball ended up getting water in the room, but it was worth it! We had prepped the kids that this Christmas was going to be different. We were traveling to a country where the people were primarily Buddhist and didn’t celebrate Christmas. We also knew there was no room for presents in our packs and Santa might have a hard time finding us. 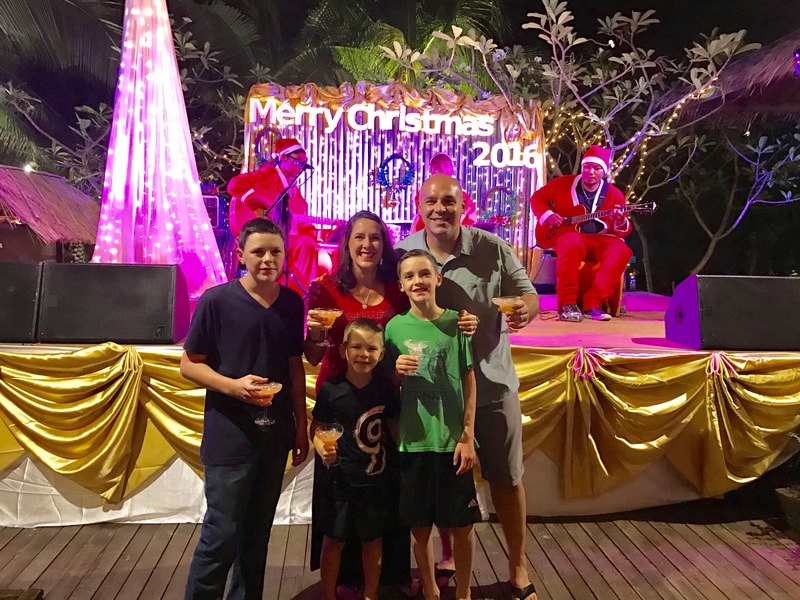 We were pleasantly surprised that our resort had a fabulous Christmas program to celebrate on Christmas Eve. 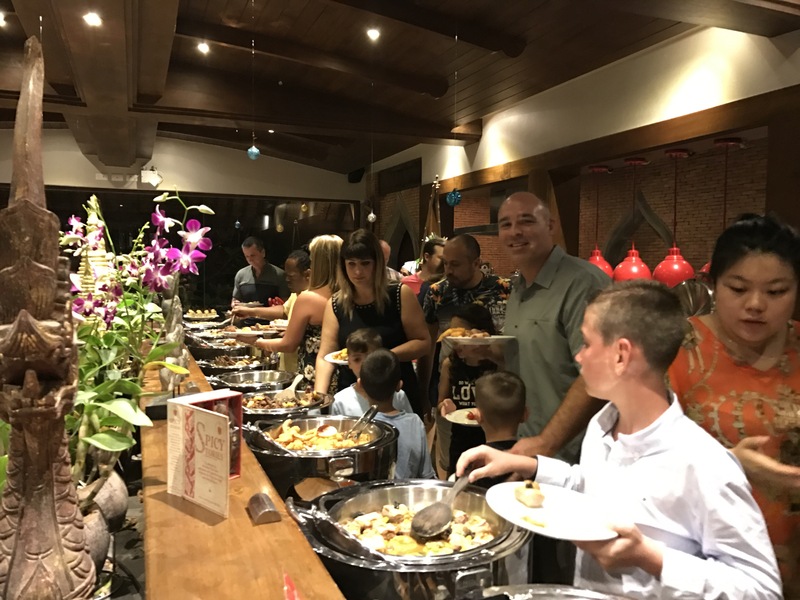 Tropical drinks, huge buffet, fire dancers, Christmas carols sung with heavy accents, and even a Thai Santa Claus bringing gifts! I’m not sure if he was the REAL Santa Claus, but he came bearing gifts so I wasn’t going to cause a scene. We woke up Christmas morning and realized Santa found us after all! 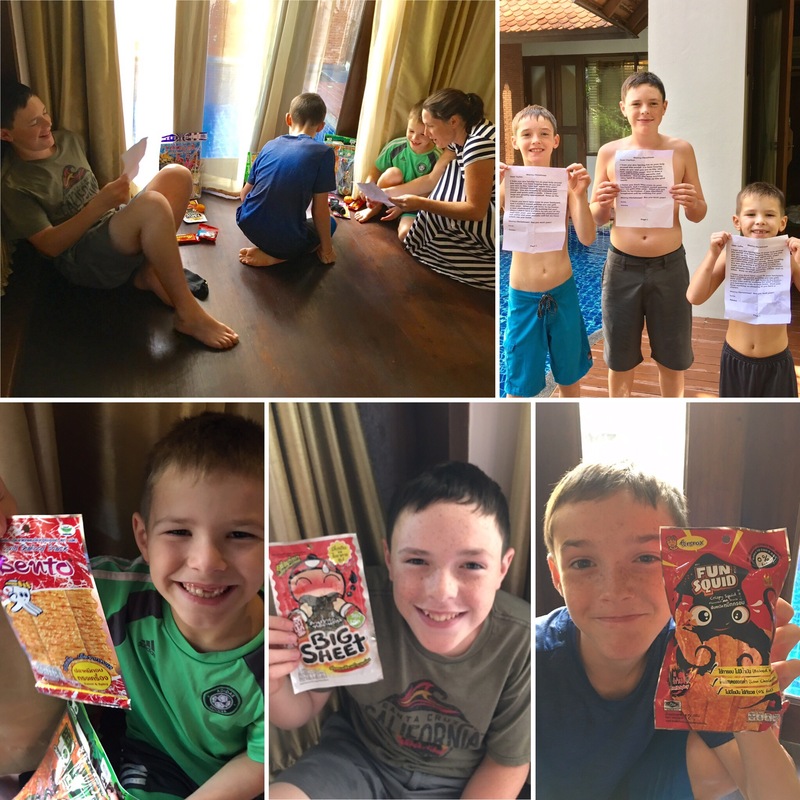 He left candy in each of the kids socks with a few Thai treats (dried squid anyone?) and a note for when they get home. It was different to be sure, and we really missed family, but we were able make the most of it and have a fun Christmas together as a family. 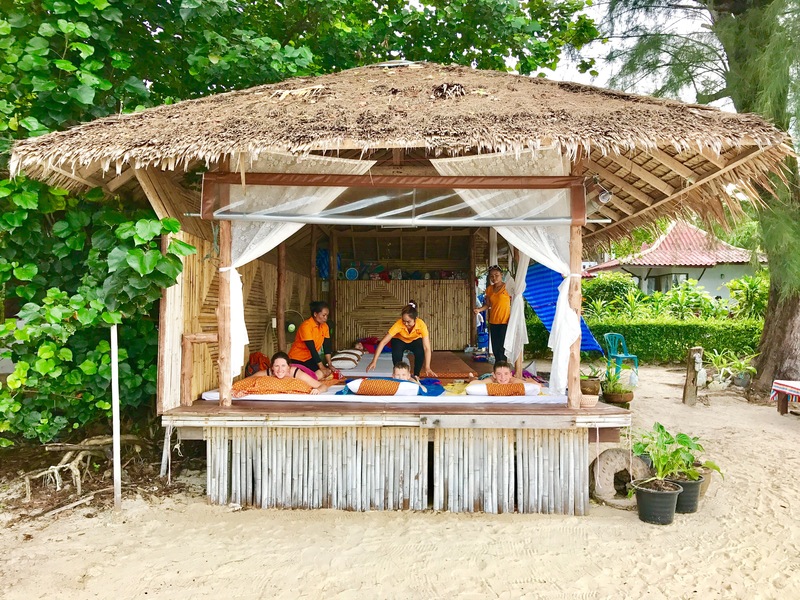 We spent the next week at the beach, getting hour massages for $7, swimming, playing in the waves, sightseeing, and just relaxing. Parker, picking coconuts for a nice drink by the pool! 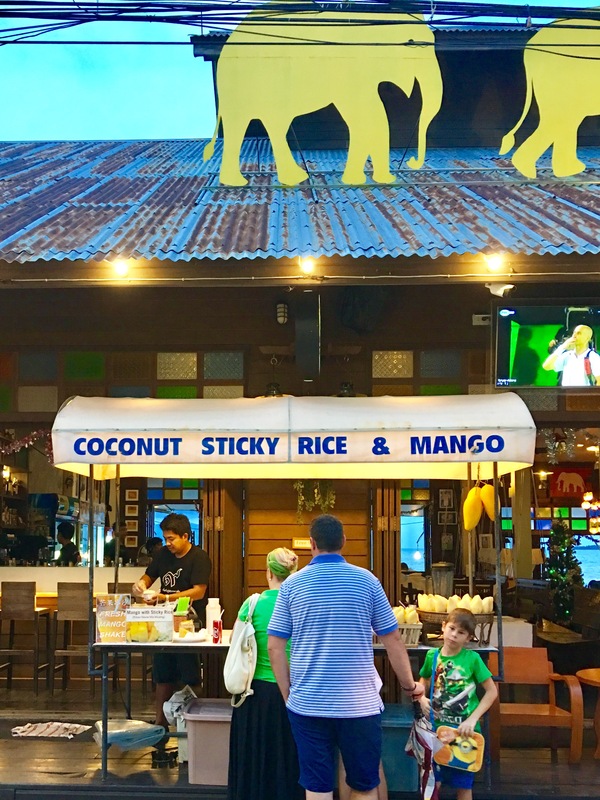 We spent a fun night eating American food and listening to great live music at The Hard Rock Cafe-Koh Samui. Fun times at Lamai Beach! 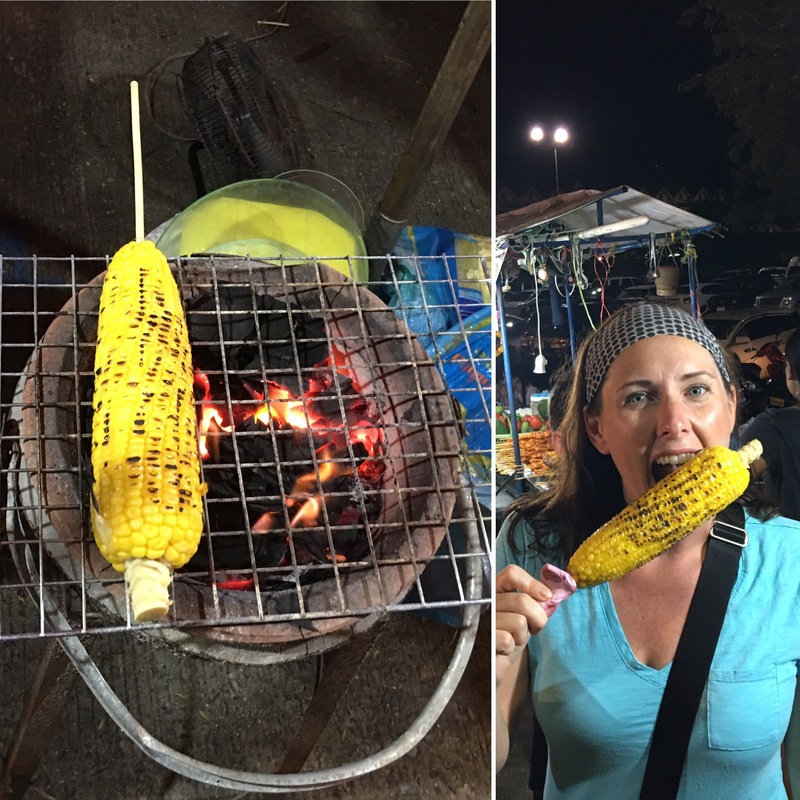 In the evenings, we enjoyed going to the night markets, checking out the handmade goods and trying out the local foods! Pad Thai, made to order! 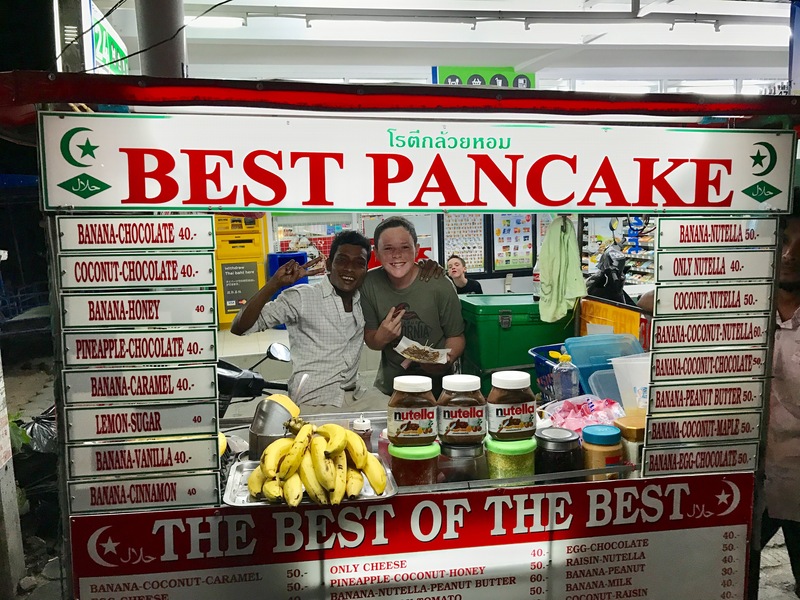 This was my favorite dessert while we were in Thailand. I’ve never tasted mangoes even half as good before coming here! Tons of knock off products for sale. Tyler loved the bling! He desperately wanted a fake Rolex, just what every 11-year-old needs! This is Joe from Joe’s Tacos. 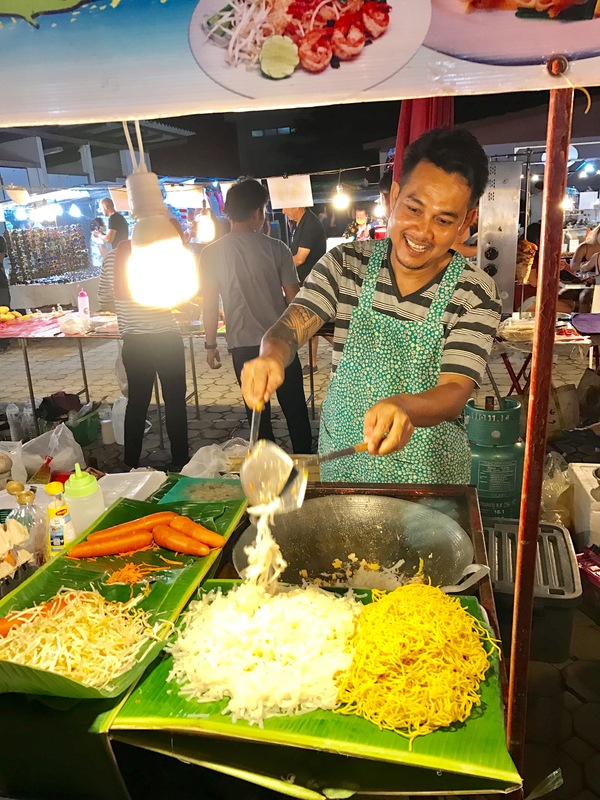 We followed him and his delicious tacos to more than one night market! 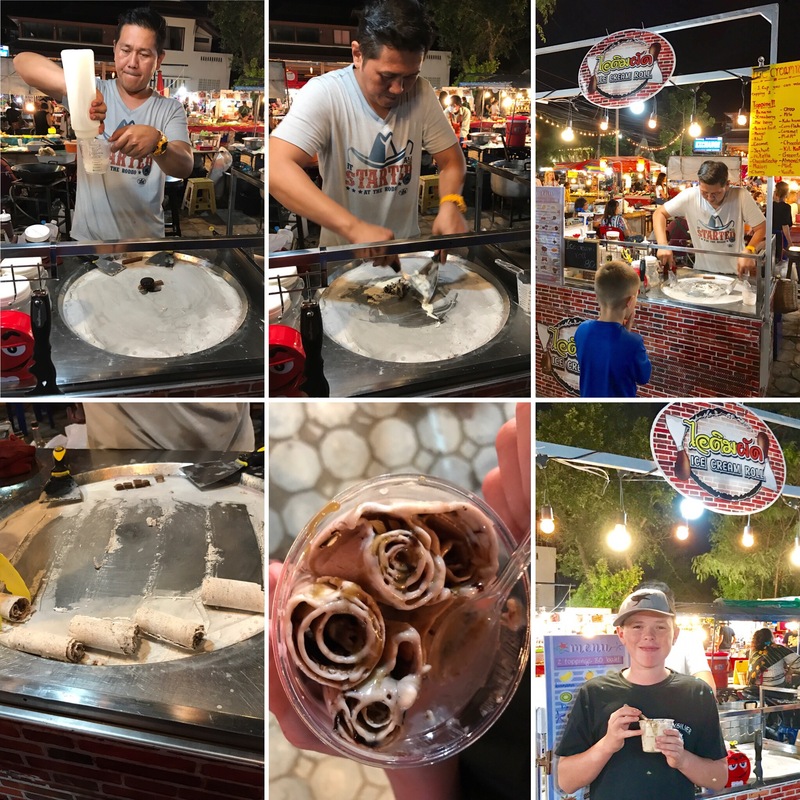 And our most favorite treat…rolled ice cream! Step 1: Put toppings on frozen tray (Nutella and Oreo). Step 2: Pour cream and sugar on the tray. Step 3: Mix. Step 4: Spread flat on tray and scrape into rolls. Step 5: Place in cup. Step 6: Enjoy! 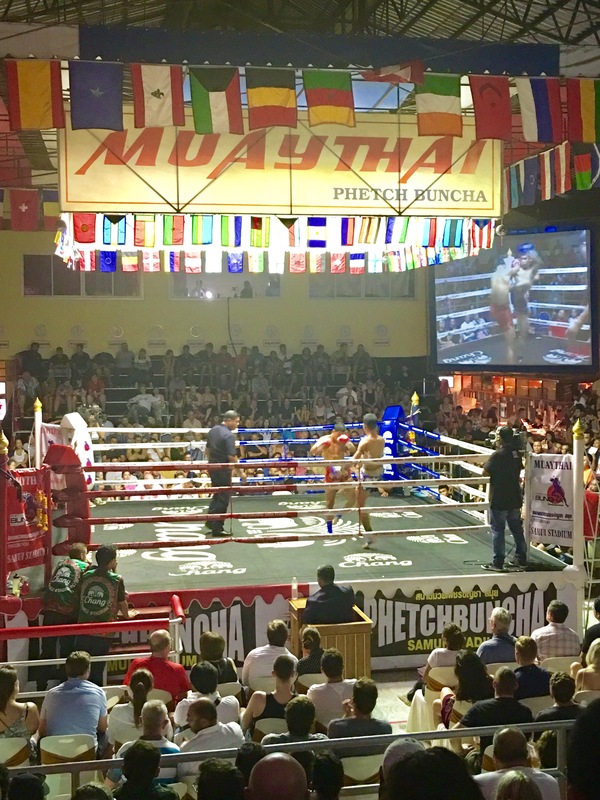 One of the most interesting and exciting nights was when we went to a Muay Thai Boxing Tournament. All week long we had been seeing the signs, the displays, and trucks rolling along the city streets with microphones and loud music advertising the event. I was nervous at first, concerned that it would be too violent for me (I’m a lover, not a fighter), but it was actually really fun and interesting. Muay Thai is known as “the art of eight limbs” because of it’s combined use of fists, elbows, knees, and shins. Violent for sure, but while watching them as they warmed up honoring their opponents and all those who have fought before them, I couldn’t help but be moved by the hundreds of years of tradition and honor being exhibited during the fighting. 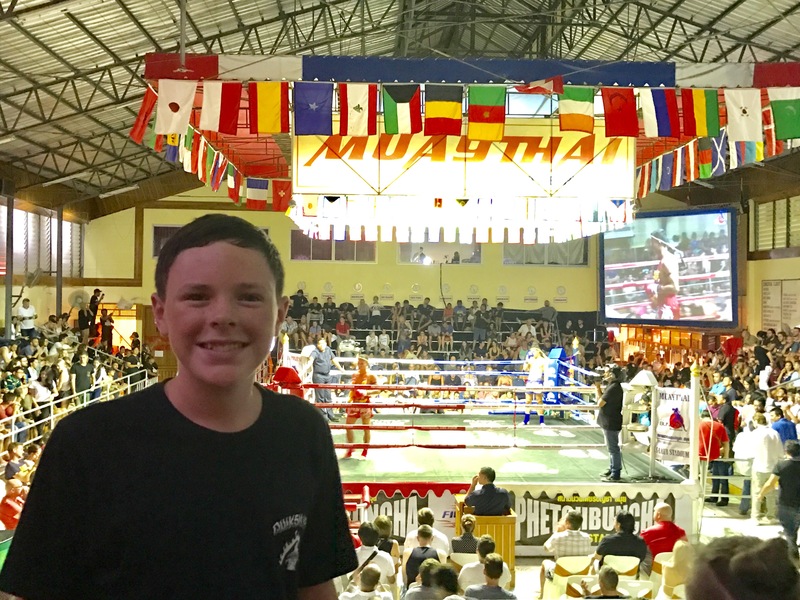 We saw some pretty good fights and a few knockouts! I felt a little bad for the few falangs (foreigners) who came to fight as the refereeing was clearly biased, even I could clearly tell! Statue of Nai Khanom Tom, considered the “Father of Muay Thai,” outside the arena. 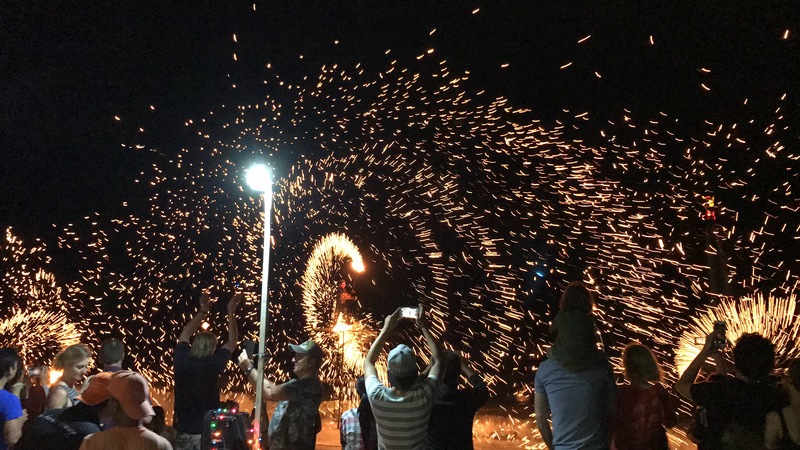 By New Year’s Eve we had moved over to Lamai Beach and had a fun time celebrating the holiday at our new locale. 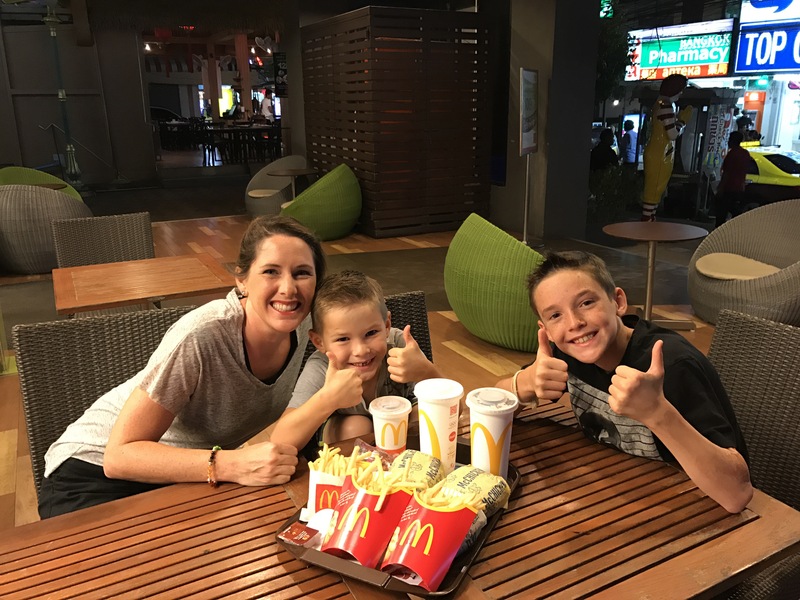 After a dinner at McDonalds (kid’s choice!) and banana Nutella pancakes from the best place in town, we headed down to the beach and went from one party to another. 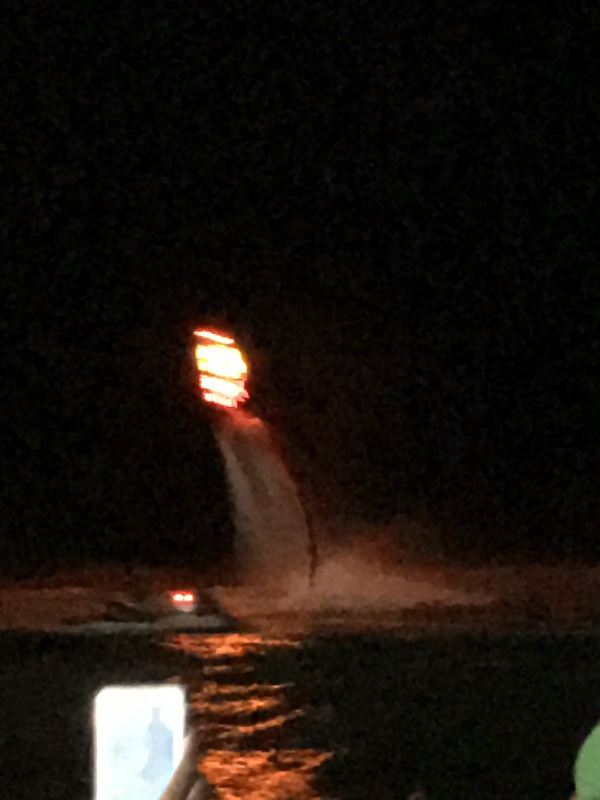 There was tons of live music, good food, fire dancers, and even water jetpack performers wearing lighted suits. 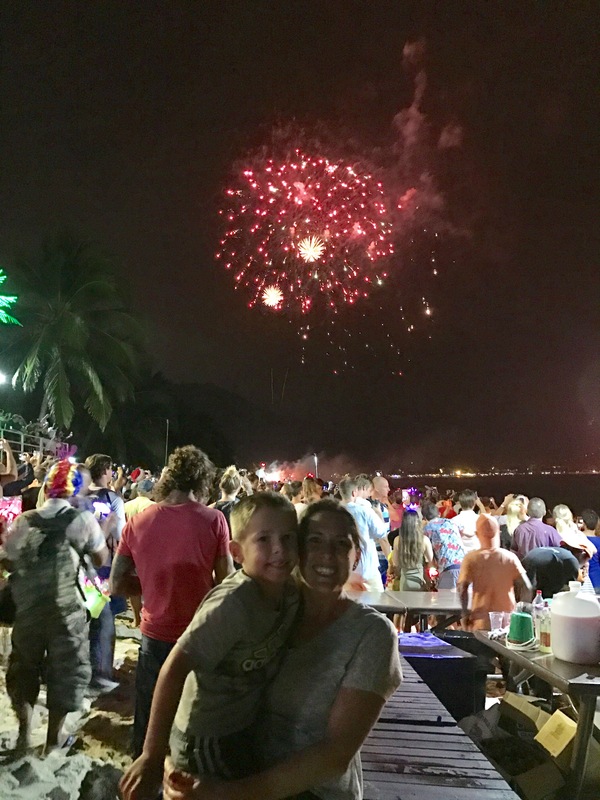 At midnight everyone celebrated with fireworks along the beach and about 2 minutes later the rain began! We ran back to the hotel and finished celebrating the New Year together in our dry hotel room. Not a bad start to 2017! We spent the next day resting and making New Year’s Resolutions as it poured rain outside. We are looking forward to a year filled with more adventures as we complete our trip around the world, as well as looking forward to returning home to familiar food, our home, friends, and family. Happy New Year from the Dixson Family! My goodness. Each entry is such a thrill to read. So impressed with how you all throw yourselves into each new place and experience. Loved the write-up on the boxing. Keep up the good work on the blog. We love it. Good to hear from you. Sister Reich and I are visiting Leland and his family in Fairbanks Alaska this month before he deploys again to the middle east. Maybe he will be close to you – relatively speaking of course. We went to a local hockey game last night where the local team won. 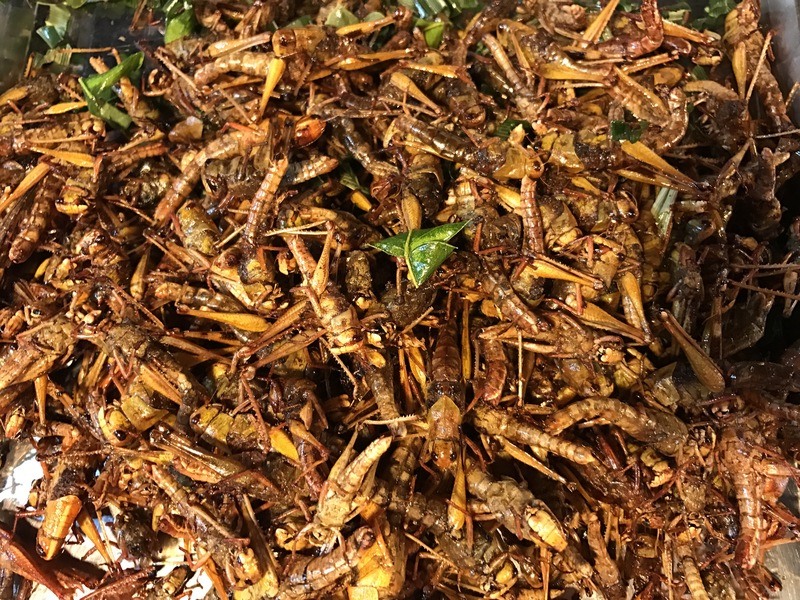 Natchos were the food of the night – nothing exotic like crickets – like you say, it’s the thought – ICKY! Bugs bug me LOL. I was a bit surprised to see you eating McD’s in one of your photos. Did they serve crickets too? Next week we are driving down to Anchorage to do a temple session. The week after that we are going ice fishing. It’s -33 degree F outside right now. I sure hope it warms up to above zero before then. BRRRRRR! Nothing like your short sleeve trip. Sounds like you are keeping busy! Glad to hear all is well. Stay warm! And you aren’t missing anything with the bugs, we are all jealous you got Nachos! Thanks Alan! No crickets at McD’s! I hope Anchorage was fun!